Audi's new second generation Q5 SUV. Audi unveiled the new second generation Q5 SUV at the Paris Motor Show, which will arrive at dealerships in Ireland at the beginning of 2017. Pricing will be announced later this year. The new SUV from Audi takes a sporty and taut stance on the street, but is almost 90kg lighter. A sculpturally flared single frame grille with a solid frame dominates its aerodynamically flat front end. It is available with headlights that are in Xenon, LED or high-resolution Matrix LED technology with dynamic turn lights. Audi says it sets the standard once again as it combines the sportiness of their saloons with a highly flexible interior, the latest innovations in Audi infotainment and up to 30 driver assistance features. 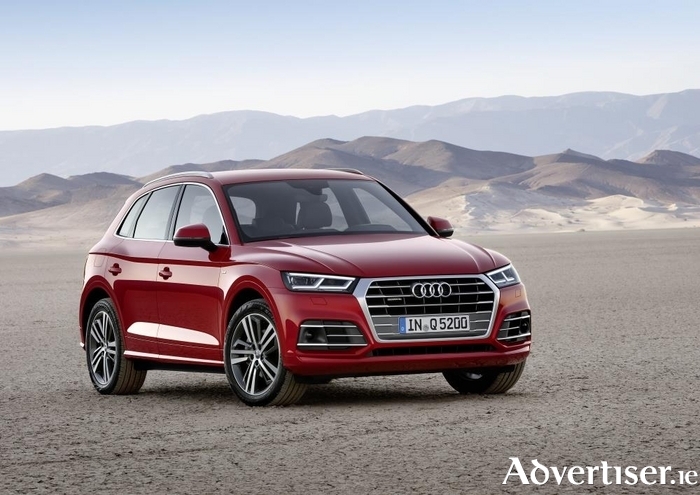 The Audi Q5 will launch in Ireland with a choice of 14 different exterior colours and five powerful and efficient engines: four TDI engines and one TFSI. Audi engineers have managed to add more power, while reducing fuel consumption. The 2.0 TDI engines have up to a 27hp increase in power with outputs of 150hp, 163hp and 190hp, and are particularly efficient. Audi drive select sees the addition of two new modes, meaning that the driver can now select one of seven driving modes. The two new modes, lift/offroad and allroad, emphasise the offroad character of the Audi Q5. The new Audi SUV comes with 18-inch alloy wheels on SE models as standard, while S Line models come with 18-inch five-arm star alloy wheels. For a sportier look, wheels up to 21 inches in diameter are available as options. The new model also stands at the top of its class in aerodynamics. The four-cylinder version attains a cd figure of 0.30 with its aerodynamically optimised roof. Wind noise is exceptionally low, and vibration comfort is high – the new Q5 indulges both the driver and passengers with the best interior acoustics in its class. Depending on the rear seat position, the basic volume of the luggage compartment ranges from 550 to 610 litres, 10 litres more than the previous model. When the rear bench is folded down, this volume increases to 1,550 litres. Cargo loading is simplified by a variably folding mat as standard, standard sensor control of the power tailgate, and manual lowering of the body via the optional air suspension. The Q5 brings Audi’s brand motto of Vorsprung durch Technik to life through its range of tech and connectivity options. Among the many options, the Audi virtual cockpit presents brilliant graphics on its high-resolution 12.3-inch screen. The driver can choose from two views – a classic view with large round instruments and a mode in which the navigation map or lists dominate. The newly developed optional head-up display projects key information onto the windshield. In addition to the new Q5, Audi also unveiled their new RS3 Saloon, which it says featurs the most powerful five-cylinder engine in the world. With a 400 hp five-cylinder engine, ground-breaking efficiency and an even sharper look, the Audi RS3 is the first compact Audi saloon to bear the RS label. The new 2.5 TFSI engine outputs 400hp, 33hp more than its predecessor. That makes it the most powerful five-cylinder engine in the global market. The compact RS model sprints from 0 to 100km/h in just 4.1 seconds, and can attain a maximum speed of 250km/h. On request Audi can increase the electronically limited top speed to 280 km/h. The unique sound of the five-cylinder unit really intensifies an already emotionally charged driving experience. Page generated in 0.1014 seconds.